Emails of the project's updates as soon as they are posted. Reminders when the project is nearing the end of the pledging period. Correspondence from the business (when they email their followers). Hooray! This project was successfully funded on May 29, 2014. Followed you over from Kiva. Excited to see you moving forward! Loans are repaid to Funders on a quarterly basis (unless businesses choose to repay them faster). This loan is expected to be repaid in full on or before May 28, 2017. The Big Bad Woof is a community resource for companion animals and their guardians. We provide access to organic, holistic and premium raw diets... read more. At Clovest, our partners are our lifeblood. In fact, nearly all of the businesses that have raised funds on Clovest belong to one of our partner organizations. As a way to give back to these great organizations, we created Clovest Communities (and affiliate badges) as a way to highlight the support these organizations provide to our favorite local businesses. If you're an organization that is dedicated to helping the growth of small, local business, or are interested in learning about the benefits of becoming a Clovest Community partner, get in touch with us at [email protected] to find out more about how we can work together. Woof Washes – Self serve dog wash with full amenities. Dog Training Center – We will have a variety of set monthly training classes by local trainers. Woof Clinics – We are planning on building a section in the store for animal wellness practitioners to meet with clients and their companions. Services may include integrative veterinarians, chiropractors, homeopaths, acupuncturists, and others. Adoption Events – Visits from local adoption groups including the Washington Animal Rescue League, Washington Humane Society, Great Pyrenees Rescue, Capital Cats, Pet Rescue Alliance and Greyhound Welfare. Taking Action Days – We plan to host regular forums and to invite different groups and organizations to come to the store to highlight a specific social and environmental issue. These events will generally not be focused on companion animal issues. In the past we have had discussions on pesticide use, plastic bag referendums, local food economies, currency and clean water. 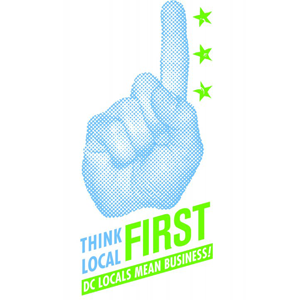 “Made In DC” Merchandise Section – We are planning a section of the store explicitly for local merchandise (mostly for humans). We are in discussion with SouperGirl and other local producers to be a pick-up shop for local goods. Five-A-Day CSA Drop-Off – We will be a drop-off point for local produce created by local CSAs (Community Sustainable Agriculture), including fresh flowers. To celebrate the success of the business' project funding campaign. To bring people together + foster an exchange of culture and ideas. To offer a chance for the business to meet & learn about their supporters! Community rewards are the businesses way of reinvesting in the community that has just invested in them. While the project's goal is the amount the business must raise in order to receive a loan, the overflow is an amount they can borrow beyond their goal. Minimum amount needed to receive loan. Additional amount willing to raise for loan. Maximum amount willing to borrow. If the business does not meet its goal, no loans are funded and no money exchanges hands. Regardless of the amount they raise, a business is still obligated to repay its loan in full.